A pouch laminator comes in many sizes. The most popular size of pouch lamination is a letter size pouch which is used to protect the standard sized paper. If you’re looking for size, try the Akiles 12.5” Commercial Pouch Laminator. This larger laminator is hot (literally), efficient and fast – making it a nice choice for the office or institution with bigger laminating needs. The Akiles 12.5” Commercial Laminator can take lamination pouches up to 12” in width without the need for a carrier pouch. And like other Akiles Pro-Lam APL models, it laminates at a speed of 0.4” per second. What makes the Akiles 12.5” Commercial Laminator stand out though is how evenly it distributes heat while maintaining a consistent feeding speed. Combine that with its durable, commercial-grade motor, and you’ve got a product that not only works but does so for a very long time. You can even adjust the temperature depending on the pouch thickness or composition and the materials that you’re laminating, meaning you’re not limited to a particular brand or model of a pouch. You also have more freedom when it comes to what materials you actually laminate. 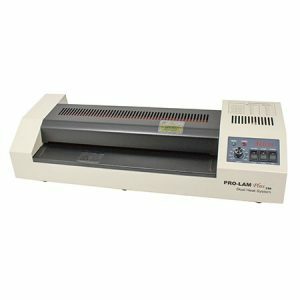 Lloyds sells the Akiles 12.5” Commercial Laminator for $299.00. The unit also comes with a 1-year warranty. For more information on the Akiles ProLam Plus 330 Plus Pouch Laminator, visit our website.